INDIANAPOLIS – The Indiana Department of Transportation today announced the launch of the Trucks Park Here system, a multi-state, regional effort to make interstate travel safer by creating a network of safe, convenient parking areas for truckers with the ability to collect and share real-time parking availability with drivers through dynamic message signs, smartphone applications, and traveler information websites. 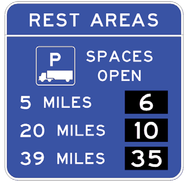 Although access to safe and convenient parking areas for trucks is essential for a robust freight transportation network, truck drivers consistently have difficulty finding areas to safely rest. Drivers who have not located parking before reaching their hours of service limits are often forced to park illegally or unsafely, often on the shoulders of highways, on and off-ramps, or at abandoned facilities. A 2013 study found that 83 percent of drivers routinely took longer than 30 minutes to find parking. It is estimated that the search for safe, convenient parking annually costs the country $4.4 billion and increases CO2 emissions by 3.3 million tons. According to the National Transportation Safety Board, 30 to 40 percent of semi-truck related accidents are the result of driver fatigue. By using this system, drivers can monitor parking availability and make better-informed parking decisions as they near the limit of their federally mandated hours of service. 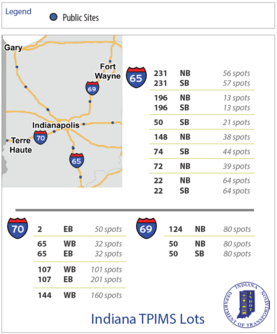 INDOT will feature 19 sites in the Trucks Park Here system along Interstates 65, 69, and 70. These routes are among some of the most important corridors in the U.S. with truck volumes already exceeding 25,000 trucks per day and expected to grow. These high truck volumes create congestion at parking sites, making it difficult for truck traffic to easily locate safe, convenient parking during peak rest hours. Trucks Park Here uses existing intelligent transportation systems (ITS) infrastructure and capabilities, along with emerging vehicle detection and data collection technologies, to monitor the availability of truck parking. It provides real-time information through multiple platforms to commercial vehicle operators for over 150 parking sites across the Midwest. Since over-the-road truck drivers typically travel at least 500 miles in a day, they will benefit most from this seamless system unbound by state lines and capable of future expansion to additional freight corridors and states. 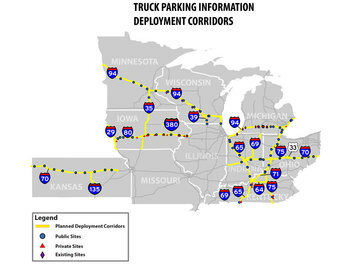 Along with Indiana, Trucks Park Here sites will be deployed along major interstates in Iowa, Kansas, Kentucky, Michigan, Minnesota, Ohio, and Wisconsin. Development of the Trucks Park Here system began in 2016 and was funded in part by a $25 million Transportation Investment Generating Economic Recovery (TIGER) grant from the U.S. Department of Transportation of which Indiana received more than $4.1 million. INDOT also contributed nearly $609,000 in state matching funds. 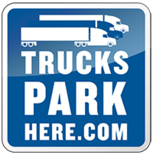 For more information about Trucks Park Here, visit www.trucksparkhere.com.